What is thought to be the rarest breeding bird of prey in the UK is nesting in Lincolnshire. A pair of Montagu's harriers are at Digby Fen between Lincoln and Boston. The birds are believed to be 40 times as rare as the golden eagle. The RSPB is running a viewpoint to allow the public to catch a glimpse of the birds. A spokesman said people would be able to get amazing views of the harriers at the site until 26 August. The watch point has been organised by the RSPB under the Aren't Birds Brilliant scheme, which runs dozens of projects across the UK aimed at encouraging people to take a closer interest in birds. The harriers prefer to inhabit open areas, such as meadows and grassland and feed on ground birds and small mammals, as well as reptiles and invertebrates. 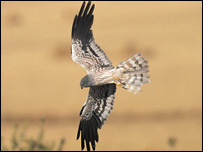 Montagu's harriers are migratory and mostly spend winter in Africa and Asia.